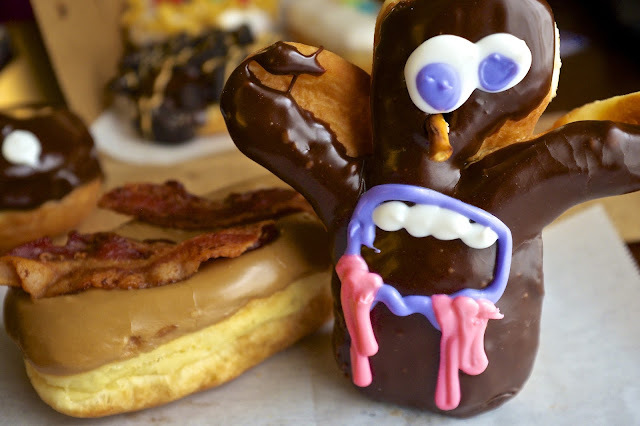 Forgive me for I have sinned: I ate this voodoo doughnut. But when in Portland, one must indulge. 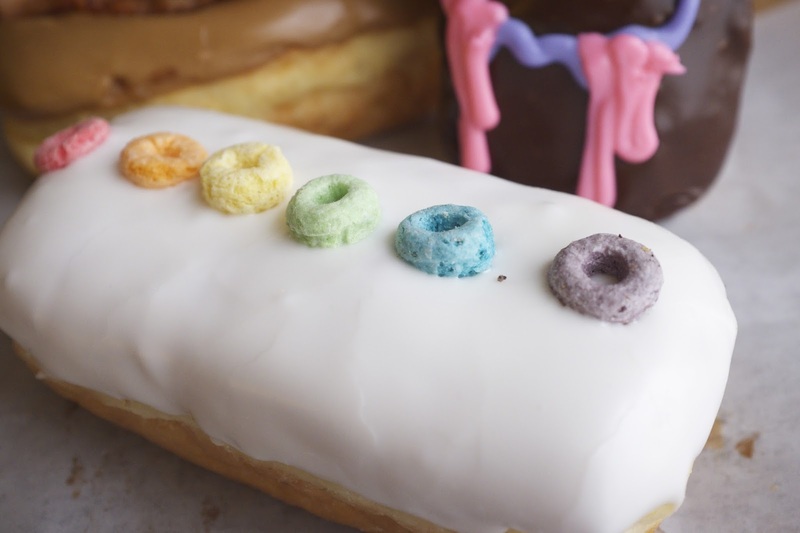 I love it when the red jelly oozes out of the centre of the chocolate frosting covered long-john. fab. Oh yah. Summer. It's been a while since I've posted what with life, teaching and mentoring. I am taking this summer off and really trying to de-stress. So what's new? I've purchased a new Fuji X100S camera. It's retro cool. All the pics here were taken with it. I haven't figured out how to use it yet...but that'll come with time and practice. So this is a post about all the groovy foodie things I've experienced so far in July. geez. The month's only half over. Highlights for me are cycling to the various local markets in Vancouver. We've hit about 4 of them so far and I've fallen hard for the vendors' amazing produce and tasty tiny strawberries! Also, we visited my fave U.S. city...Portland, Oregon a week ago. We stayed at the Embassy Suites hotel in downtown Portland again because I just love the Art Deco building and the Happy Hour every day (along with the comp cooked to order breakfasts!) As well, they are a mere 2 blocks' walk from Voodoo Doughnuts! and the Saturday Market! yikes! so much coolness--of course I had to indulge. Yes, I know...gluten. I did my best to be GF for as long as possible. I waited until the end of the trip to eat half a doughnut and see how my stomach took it (and in case I doubled-up in pain in the beginning of the trip...not a good thing). It went relatively well; I ate the other half and brought the box up to Vancouver. 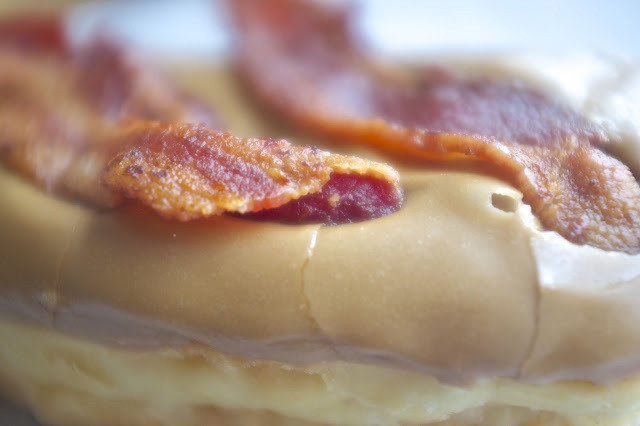 Maple Bacon: another fave. You can't go wrong with bacon. Yes, good things DO come in pink boxes. 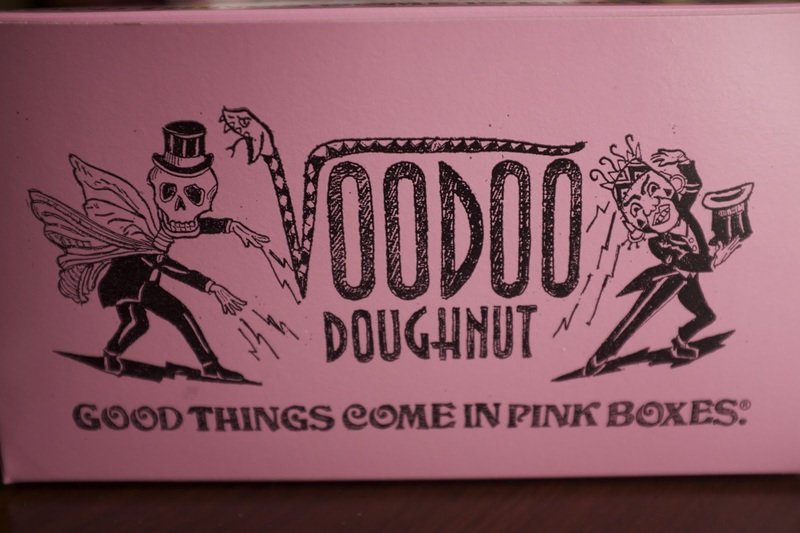 I'm wondering why we don't use pink boxes in Vancouver, Canada? 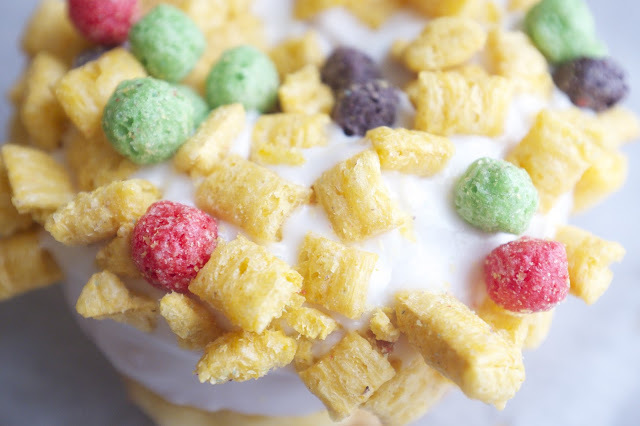 But, what was better than Voodoo Doughnuts this time? 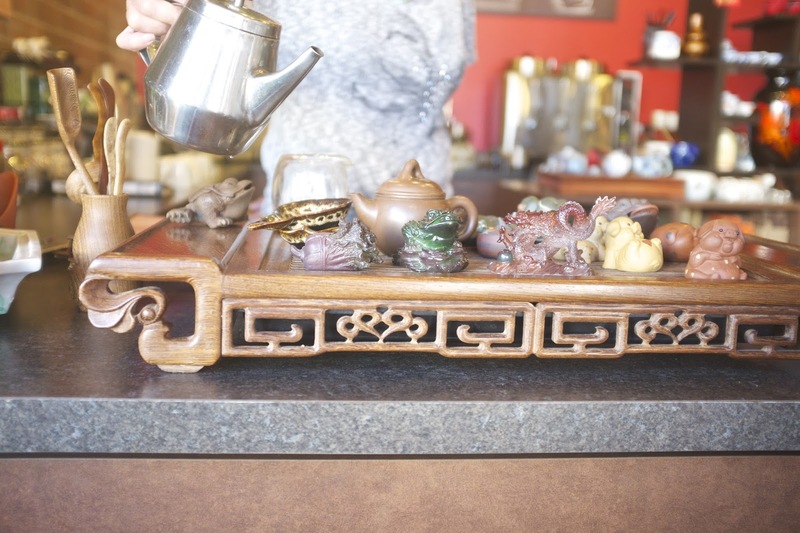 well, we were wandering around Portland's Chinatown and came across this tea house called Red Robe Tea House & Cafe. It was the cleanest and coolest place I experienced in this slice of the city. Inside, there's dark wood and tea ceremony paraphernalia everywhere! I was in heaven. Of course, they have bubble teas too (which my kids ordered). I ordered a 2006 Pu Erh. I don't know my Chinese teas too well but I know that good Pu Erhs are better aged...the older the better. I also know that Pu Erh suits my constitution because some old Chinese guy told me so when I visited a tea shoppe in Vancouver's Chinatown. I used to drink tons of green tea and it was too "cooling" since I'm hypothyroid and have Hashimoto's. So he suggested Pu Erh (Bo Lay in Cantonese). I haven't gone back to green tea much since then and have since learned of its benefits: weight loss, vitamins B1, B2, C and E, potassium, magnesium, zinc which I need apparently because of my Hashi's, and a bunch o' others which I think you can google later (anti-oxidants, digestion, lowering cholesterol, lowering blood pressure, increasing metabolism, "blood cleansing"?) if you want! All I know from growing up is that my parents always drunk it...it was the default Chinese tea in the pantry. My father always told me as I recall...that if you eat a lot of greasy food (i.e. dimsum or a huge bag o chips) you've got to accompany it with a huge pot of Pu Erh (Bo Lay) to counteract the grease. It works. Trust me. You'll feel better. Steep it dark. Real dark. Chinese Tea Ceremony with 2006 Pu Erh Tea at Red Robe Tea House and Cafe in Chinatown, Portland, Oregon. The service was so friendly and helpful and the waitress I think was the owner's daughter. She was a cutie and very helpful with informing me about what to order. The young lady's parents entertained my kids by showing them what the Chinese tea ceremony "tea pets" could do. My kids wanted a little Yixing clay piggy but alas, I didn't buy it. I should have. One of the piggies squirted water when you poured hot water over it! that was so cute. The resin figurines changed colour when you pour hot water over them. pouring hot water on the Yixing clay and resin "tea pets"
I'm hooked: fantastic tea that gives over a dozen or more infusions served in a tiny tea cup and with all the tea paraphernalia. You know me, as soon as the chinese tea ceremony started, I knew I wouldn't leave the shoppe without some sort of tea ceremony paraphernalia. I purchased a few things I'll post about later. heehee. btw, I already have a collection of a few Yixing teapots that are a few decades old. As the pots age, they take on the flavour of the tea leaves that you've chosen to use in the pots. 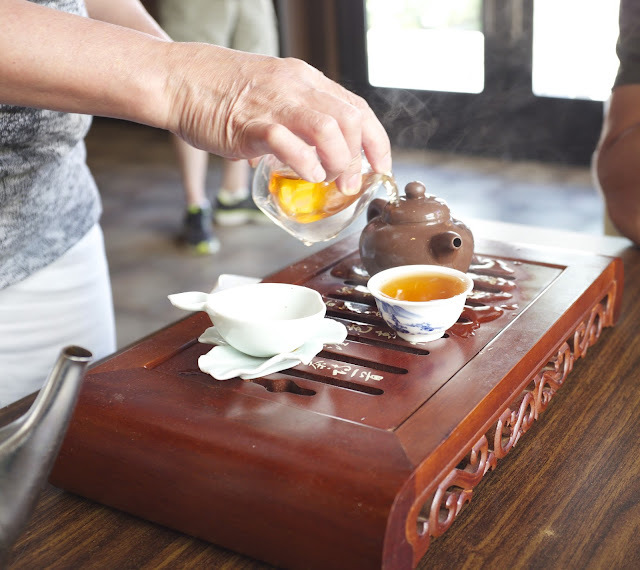 In case you didn't know, a Chinese tea ceremony isn't anything like a Japanese tea ceremony where everything has to be precise and seems quite formal. 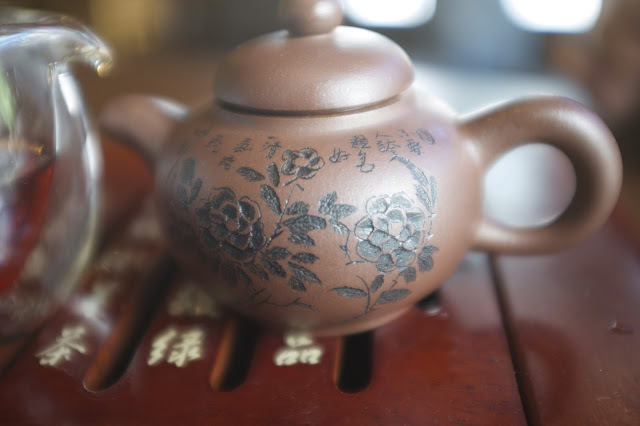 A Chinese tea ceremony in fact is more relaxing (you don't have to worry about the details as much) and can be just as zen-like. My daughter's fave is called "Mantra of Joy" by Xu Qing-Yuan (which is the one being played in the background in the youtube video I posted). I also have "Green Tara Mantra" from Surya and "Mantra of the Green Tara" from Imee Ooi. Sing with me if you've got the ear-worm now: Om Tara Tuttare Ture Soha... (repeat that 108 times now!) My 6 year old loves the song because she's memorized the words pretty easily. 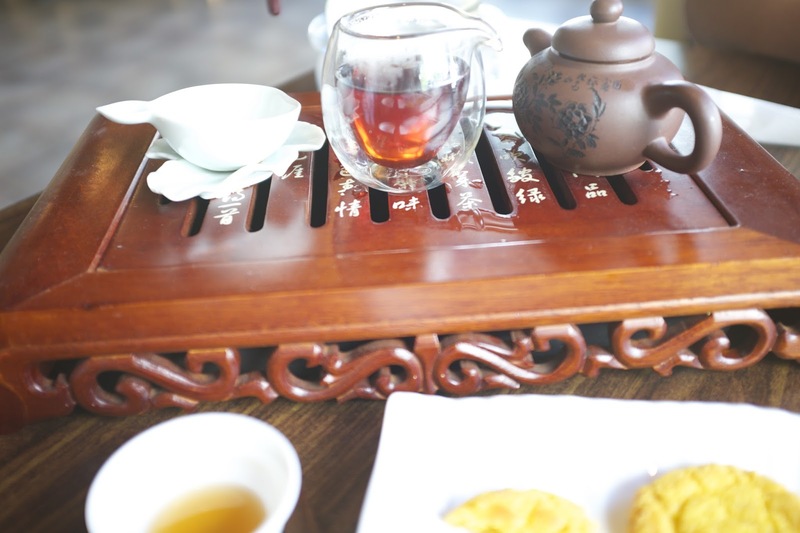 By the way, if you're wanting some Chinese tea ceremony stuff and you're in Vancouver, I suggest you go visit The Chinese Tea Shop in Chinatown, Vancouver. I purchased quality Pu Erh there and they also have the Yixing teapots and stuff too. I posted about my previous purchase here. 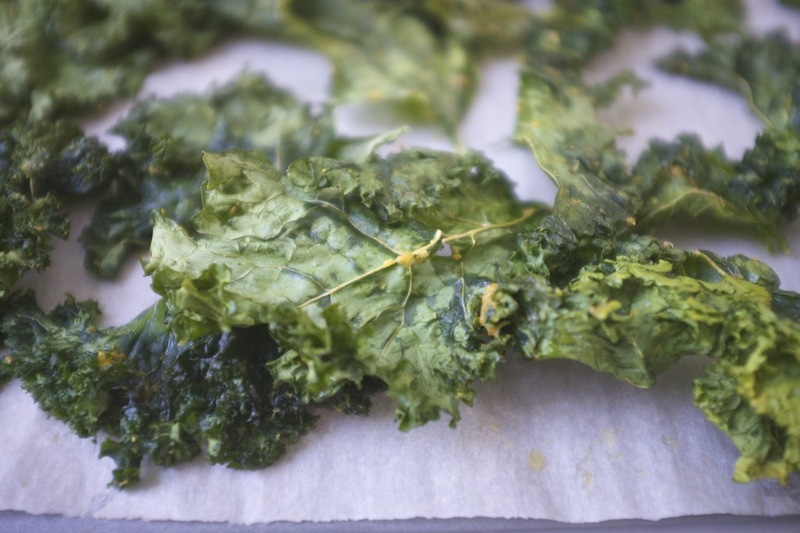 Another highlight of my summer thus far: dehydrated kale chips. Yah. I know, you've already had it and think it's great too! However, I had completely forgotten that I had a dehydration feature on my Wolf oven. I had been baking them at 350 degrees F...which sometimes imparted a burnt flavour to some of the tinier leaves. Now, I bake at 140 degrees F and they're perfectly dry in a couple of hours. I like them dehydrated more than baked. Even the kiddies love 'em and they DON'T EAT VEGGIES! lol! they think they taste like chips! *doing the happy dance*! 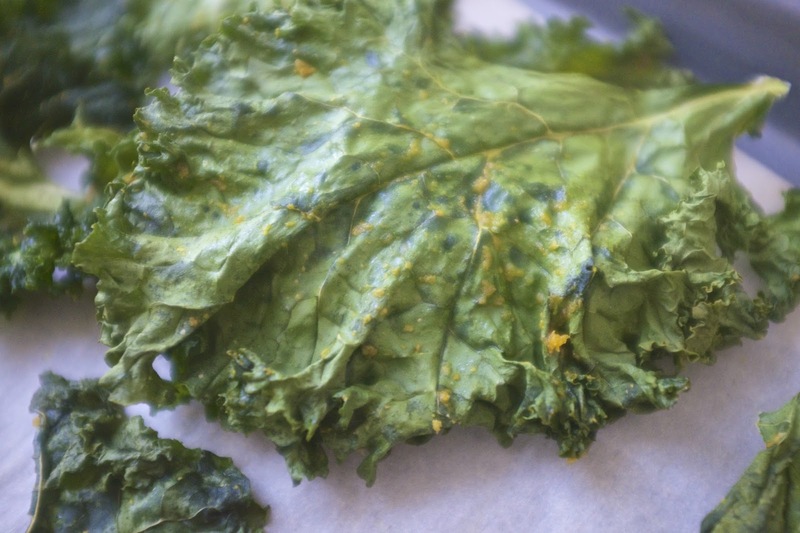 I think it's important to buy organic kale if you're going to bother dehydrating kale. I also bought a bag of nutritional yeast and like to toss that in with the oil to create a slurry and then massage the leaves with the mixture. 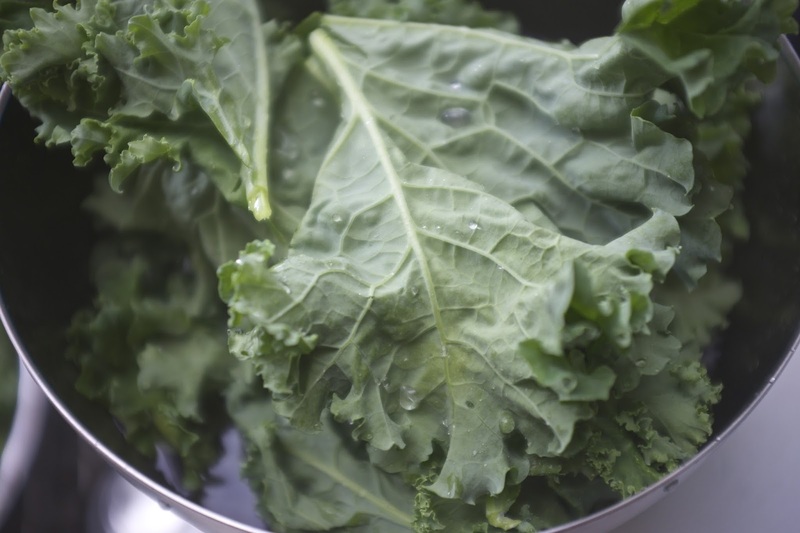 I find that this more evenly distributes the flavouring on the kale rather than drizzling on the leaves and sprinkling the dry ingredients later. 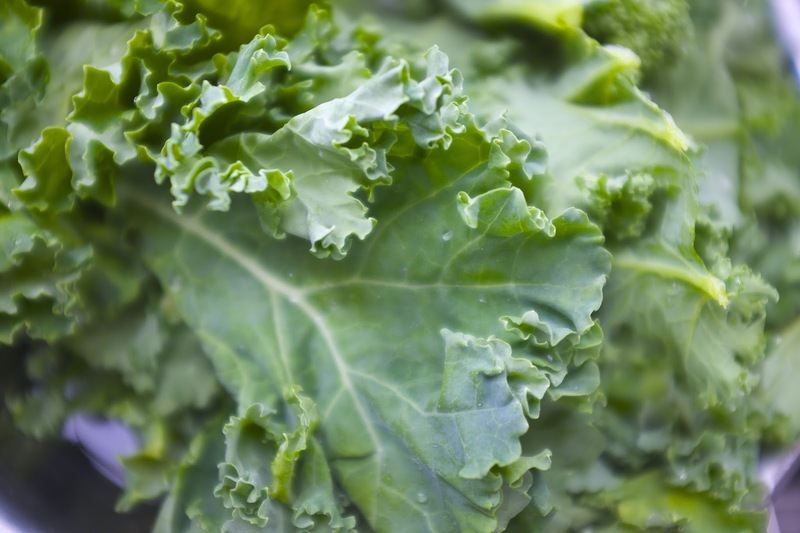 For me, one bunch of kale (a huge bunch!) 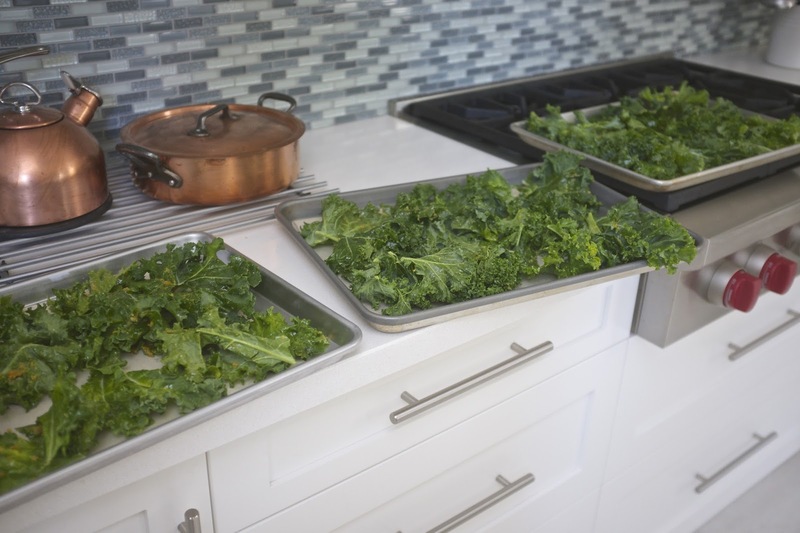 makes 3 sheets of dehydrated kale. They shrink down considerably after dehydration and don't last long in the house. The kids inhale the chips like they're junk food. Dehydrate at 140 degees F for a couple of hours. 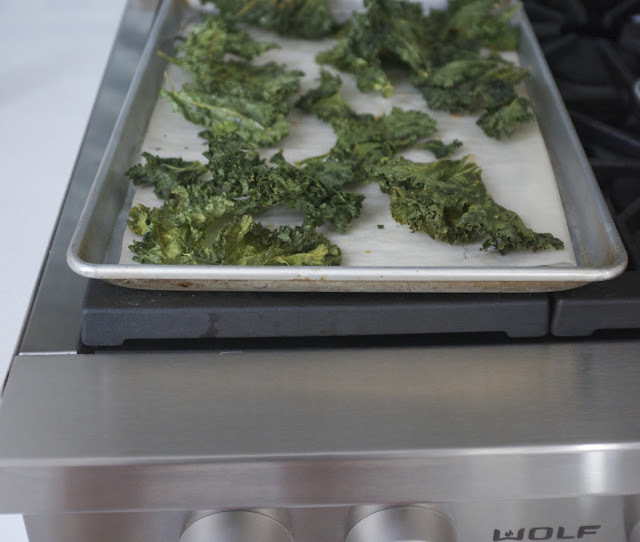 I use my Wolf Oven (which incidentally has the ability to go down to 85 degrees F if need be). I stuck a wooden spoon in the door to keep the door ajar and waited until the leaves were shatteringly crispy. These were shatteringly crispy good. The nutritional yeast gives it a kind of cheesy flavour. The garlic powder is a must. You can add a myriad of other seasonings but I like it simple. July has been mighty fine thus far. I'm hoping you're having a good one. 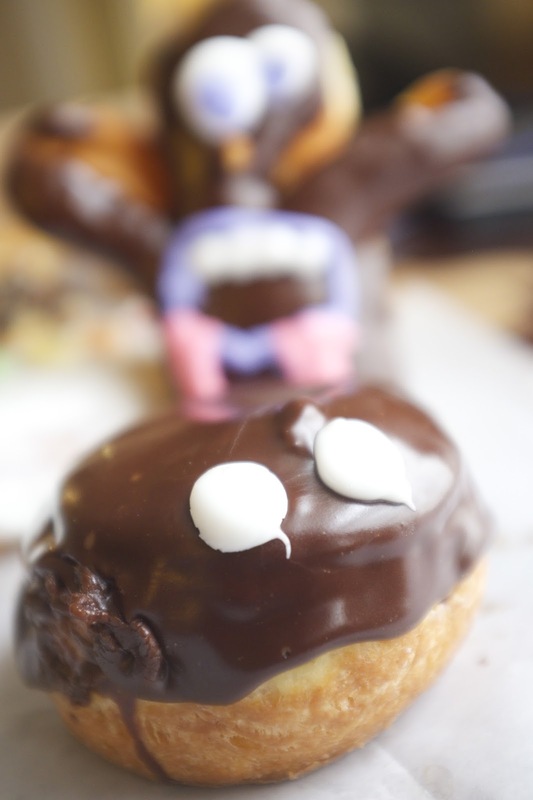 Since the doughnut incident, I've eaten GF clean since. However, in the summer I also dabble in the Paleo lifestyle. I can't go long without sugar though of course, so I do Paleo part-time but I've been back on the Fitocracy bandwagon almost every day since summer started. Love that site. great people. Love my kettlebells too. 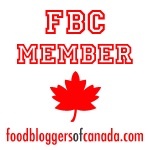 More exciting foodie experiences are coming up so stay tuned!